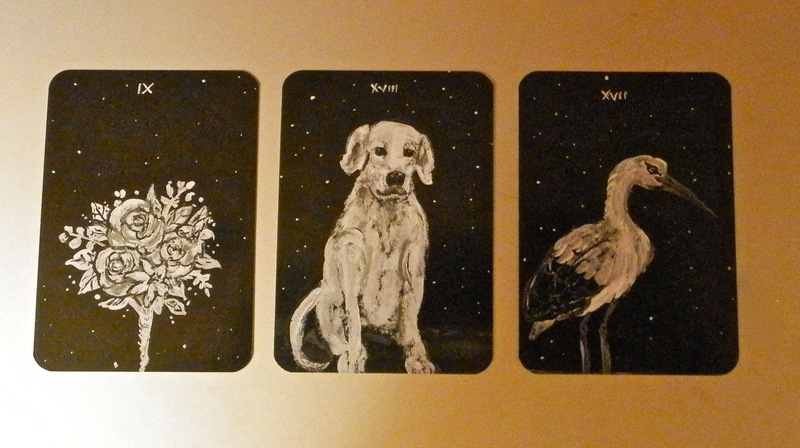 Today's Draw: Bouquet/Dog/Stork from Le Petit Lenormand Noir by Robyn Tisch Hollister. Are you hitting a roadblock in your manifestation efforts? Do you have a hard time "letting go and letting god"? Is your ego getting in the way of your wishes? Sometimes I'll pre-order something and forget I bought it. Then I'll get a wonderful surprise in the mail, like I did today with Le Petit Lenormand Noir. There are a couple of different ways I'm tempted to read this trio today. One is that the dog sits between a gift (bouquet) and change or new beginning (stork). So in this case, it's like saying my babies are the agent that spells the difference between something nice to have in my life and something truly transformative. Which is entirely the case in my life. Another way of reading the trio is that gratitude (bouquet) and trust (dog) bring transformation or something new (stork). This one fits more into "we are so much more awesome than we know" week, so this is the one I'll go with. However, it's a topic we've discussed many times before and that's manifestation, which is basically the art and skill of creating what you want in your life. Most of the time we talk about this in terms of what you should ask for. I always say to ask for an emotion, rather than a thing, because it's the feeling that you really want. You can wish for a million dollars and get it, but it may not make you feel happy...or rich...or powerful...or secure. In fact, it could leave you feeling stressed, overwhelmed and afraid of thieves. Or you may over-spend, not taking taxes into account. So if you want to feel secure, why not ask to feel secure instead? Then it doesn't matter how much money you have. You feel secure and that's all that matters. But I don't talk as much about gratitude and trust, which are equally important factors in the manifestation process. If you believe that what you focus on grows, then gratitude is a powerful tool in your manifestation arsenal. Gratitude says to the universe "yes, please. Give me more of this." But the tricky thing about gratitude is where it intersects with trust. In fact, the duo present the toughest challenge in getting what you want. So let's say you want to feel secure. You put that thought out into the universe and a couple of weeks later your credit card bill comes and they've upped your minimum payment. And you naturally think, "gah! This isn't what I wanted, stinkin' universe!" But the universe needs to up your minimum payment so that you pay off your credit card so you'll feel more secure, see? So when you get all piffy about it, it's like saying "forget what I said about feeling secure." And so now what's the universe supposed to do? Trust requires you to give up control. It requires you to let go of the "how" of how you're going to get what you want. As my favorite manifestation guru, Mike Dooley says, "your job is to say what. The universe's job is the how." And it's so true. But, see, we all think we know exactly how things should pan out and just how things should look when we're getting what we want. When we exhibit that kind of control through our thoughts and emotions, though, we're screwing everything up. Because what is the other part of this equation? Gratitude. So, no matter how crappy things look, we have to resist the urge to complain and, instead, say "thank you for upping my bill, universe. I may not see the wisdom in it now, but I trust you're acting in my best interests." What you genuinely think and feel will be mirrored back in your results. See, in my experience, the universe actually conspires to give us the deluxe package of those things we ask for. But it can only do that if you give it the leeway. So you can ask for a million dollars and get a million dollars (though it's possible someone might have to die and leave you an inheritance to get it). Or you can ask for "a monetary situation that makes me feel secure." And then the universe will not only give you the money you need to make that happen, but the other tools you need to convert $$$ into true security (aka the "deluxe package"). Get it? But it may not look like you think it's going to look while you're getting it. Because sometimes the universe has to destroy in order to build on a firmer foundation. And you have to take responsibility for that if you want what you want. And you have to trust in the process. And be grateful for it. Leave out any of those elements (along with detaching from outcomes, believing what you ask for is possible and acting in alignment with your wish) and you'll keep hitting a brick wall with your manifestation efforts. So gratitude and trust bring the change you seek. It seems so simple from the outside...and it actually is. But it does require some discipline on your part. However once you manage to hit the sweet spot, you'll be shocked at how promptly and generously the universe provides. 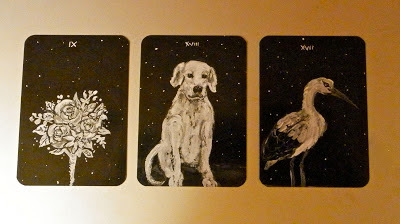 If you want to learn more about manifestation, search the keyword "manifestation" on my blog at www.tierneysadler.com.